AP450L - G & W Machinery Sales, Inc. The AP450L Wire EDM features Sodick’s Linear Motor Technology. 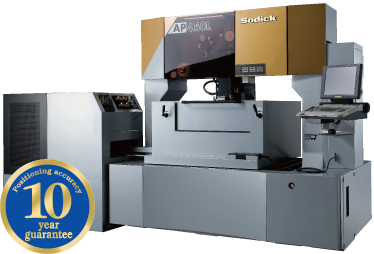 The AP Series is Sodick’s line of high end, high precision machines. The AP450L is a fine wire machine that is ideal to EDM small intricate precision parts requiring fine wire diameter and cutting accuracy of 2 micron. With oil dielectric, the AP450L ensures the minimum over burn resulting in maximum cutting accuracy. The AP450L Wire EDM features the newly developed LN1W power supply unit and utilizes “Perfect Active Control” technology. It also uses 1 Gbit/sec serial communication technology featuring high-speed processing of the discharge control and motion control in a simultaneous process. The new high speed, automatic, annealing wire threader improves wire straightness which increases the AWT repeatability especially at larger Z heights. During the annealing process, the wire is heated, stretched and cut to a sharp point resulting in a smaller required wire guide clearance improving part accuracy. The tensile force of the wire is monitored by a sensor installed in the wire traveling system for data feedback to maintain the optimum condition. 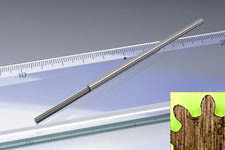 Since the annealing AWT can thread in the submerged mode, the worktank does not have to be drained when wire threading. The Z axis position will automatically set the dielectric fluid for the operator. The AP450L offers a highly-rigid cross-roller guide that minimizes sliding resistance with friction to maintain high levels of straightness.